Imagine reading this on your bus or train commute, cover out so all can see. You know you want to! MAGA 2020 & Beyond is edited by Scott Rinehart and features Milo Yiannopoulos, Jon Del Arroz, L. Jagi Lamplighter, Marina Fontaine, Brad Torgersen, John C. Wright, Declan Finn, and Arlan Andrews Sr. This was the moment we came together to elect Donald Trump to President of the United States of America. 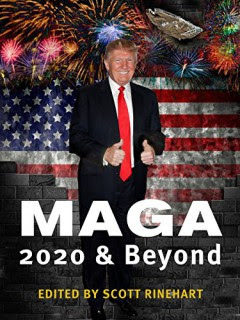 MAGA 2020 & Beyond tell the tales of a prosperous future where evil is defeated, the border wall is built, society has righted itself, space exploration is common and world peace has been attained. These aren’t just fantastical stories of a far fetched future, they are stories of a future that can be obtained. MAGA 2020 & Beyond is available for pre-order now and will be released on Nov 8, the one year anniversary of President Trump's election. What better way to celebrate?